This beautiful brand new luxury Liveaboard features the facilities that would indulge you with choice. Spa, , Jacuzzi are additional facilities to the friendly service that you could benefit from while seeking new dive sites, surf breaks and coral gardens around the most exotic destination of the world. The best way to spend your holidays doing nothing: Just board Princess Rani, we will take you exploring through waters of azure lagoons, coral gardens bustling with multicolored marine life, snow white sandy beaches circling lush green patches of islands, caressing cool breezes of the Indian Ocean, breath taking sun sets, moonlit silvery nights and the serenity as a whole that would re-awaken the mind and soul. For the active and the adventurous, Princess Rani will take you diving to some of the very famous dive sites around, as well as the secluded and unspoilt dive sites discovered on our quest through the atolls. 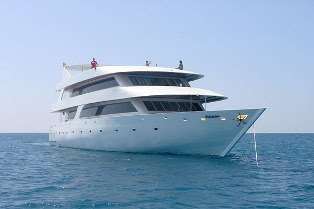 We promise you an unforgettable experience onboard Princess Rani, from the beginning to the very end of your holiday. All cabins are very spacious, fully carpeted with individually controlled air-conditioning, pleasant interiors, comfortable beds, suite bathrooms with hot & cold water. Facilities: Large Lounge deck with spacious saloon, restaurant, well stocked bar, disco, karaoke, media library, plasma TV with DVD & VCD player with surrounds speakers, Board Games. Big sun deck with loungers, Jacuzzi, Spa with indoor and outdoor treatments.